A CD recording with a lively collection of familiar and unusual traditional songs and dances from the middle ages that celebrate the winter season and its associated festivals and holidays. Songs from the British Isles, Ireland, Germany, France, Poland and Sweden blend medieval and renaissance tonalities with a festive folk energy that awakens the spirits of past ages. 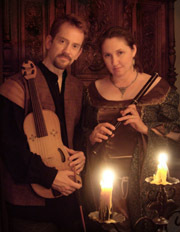 Beth and Barry's robust voices combine with a wide array of rustic and refined musical instruments reaching back to medieval times. Barry and Beth Hall: voice, vielle, lute, dulcimer, viola, violin, mandolin, guitar, sitgar, flute, recorders, French horn, herald trumpet, doumbek, tar, bodhrán, tabor, tambourine, cymbals, bells, African drums, and other percussion instruments. 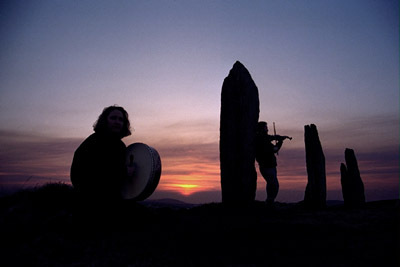 "Barry and Beth Hall are folk musicians who play medieval music with exuberance." - Tom Manoff, Classical Music Critic for National Public Radio's "All Things Considered"
THE BEST MEDIEVAL CHRISTMAS CD - EVER! What a find this remarkable CD is! If you love authentic Medieval music, played with the authentic instruments of its time and sung in the same way that a nobleman's court of the 14th or 15th Century might have heard it--this is the one for you. Beth and Barry Hall, both very gifted musicians, offer the finest collection of European Medieval carols I have yet found, and I have a large collection of the music of this period. A Bravissima performance to be savored all year round. Good Lords and Ladies all, grab this one! I have been listening to this album for two Christmas seasons and never seem to tire of it. The instrumental pieces are very well done, beautifully providing delicate, intricate harmonies. The vocal numbers are equally well done. There is a nice selection of songs, some familiar to the modern listener, and some providing a good introduction to medieval music. This is Christmas music for all ages. 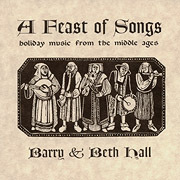 This is holiday music from the middle ages, by Barry and Beth Hall. They do performances of my favorite antique classics such as "Masters in the Hall", "Quem Pastores Laudavere" (a 14th-century Latin chant, performance reminiscent of a midnight monastic Gregorian chant, with deep-toned church bells and ritual drumming); "Mors Vitae Propitia" (high energy 12th-century French song from Piae Cantiones, sung in Latin and accompanied by vielle, lute, flute and percussion); "Personent Hodie" (medieval song from the Piae Cantiones, sung in Latin and accompanied by recorders, vielle, lute and percussion); and "Nous Voici Dans La Ville" (haunting traditional French melody, performed on fiddle, mandolin and recorder). Their sound is phenomenal, and this CD belongs in every Christmas collection. I ABSOLUTELY LOVE THIS CD! I love this music, and even though I feel silly listening to Christmas Music in the SPRING time I haven't stopped playing it since I got it... over and over again. I especially enjoy the second song. It is so upbeat and lively! This is on my playlist all year. I've never heard anything else that so beautifully captures the flavor of Christmas, in a way that brings to mind all of the richness, warmth, simplicity and sanctity of the medieval celebration. The flavor is not secular. This is just like drinking a steaming hot spiced wine in a cabin with a fireplace and a stone church visible from the window, full of meaning and warmth. The singing and instrumentation are really something else. A Feast of Songs is a gorgeous journey through a millennia of different cultural takes on the Christmas theme. The first and last tracks are oddly strong and powerful - though they did take a few listenings to appreciate. But the renditions of Patapan and others are stunning, and flow beautifully from one into the next. Gorgeous music. Buy it. Listen to it every day. Live the season and do so boldly! Dzięki tej sympatycznej płycie poznamy pieśni, jakie towarzyszyły tradycyjnym świętom w tradycji folkowej sięgającej średniowiecza i renesansu. Boże Narodzenie pojawia się tu w pieśniach angielskich i łacińskich. Album rozpoczyna dość popularna "Gaudete", którą folkowy świat poznał dzięki interpretacji Steeleye Span. Później mamy przegląd muzyczny, który pokazuje różnorodność gatunkową tematyki bożonarodzeniowej. Instrumentalny "Patapan", czy wesoło zagrany "Mors Vitae Propitia" występują tu obok bardziej dostojnych utworów, takich, jak "Il est Né le Divin Enfant" czy "Green Growth the Holly". Album nie traci przez to jednak spójności. Czasem jest sakralnie ("Quem Pastores"), a czesem lekko i dworsko ("Christchurch Bells"). Jednak dla mnie najciekawszym utworem na płycie okazała się kompozycja "Journey of the Magi", kojarząca się nieco z dokonaniami Dead Can Dance. Price: $12.99 (CD) Includes FREE SHIPPING in the USA. Click here to see other CDs and videos available from Burnt Earth - all with FREE SHIPPING. Copyright ©1995-2016 Barry Hall, Hallistic Music. All rights reserved. Unauthorized duplication of page content, source, images, sound or video files is a violation of applicable laws. Woodcut on cover by Mary Azarian. Used by permission.